If I told you that the only thing any coach ever cares about is your production as a ballplayer what would you say? I mean, in the end… at the end of the season… look back and tell me how productive you were with two outs and a runner in scoring position. Or, how often did you knock the runner in from third base with less than 2 outs? Or, how many times were you able to move that runner up a notch so your teammates behind you in the lineup could hit him in? In the end, my friend… it’s all about how you produced. That’s in the end. How do we get there comfortable enough with our performance that we can look back and say… Ya, that is the formula for success. If I just keep doing that every time, in the end… my production will be respectable and I will be a valuable part of my team. No matter what team that is! Well, here is your best batting tip ever; Leave the inner third of the strike zone alone! 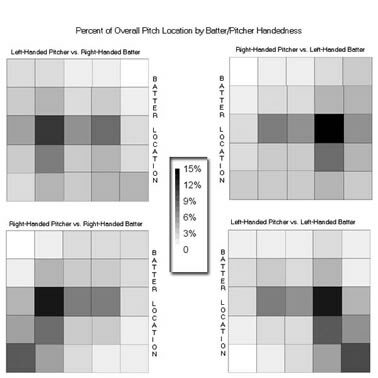 Fewer pitches are thrown to the inner third of the strike zone than any other location. Even fewer of those are actually strikes. Most are simply “a purpose” pitch designed to get you out with “the next” pitch in the sequence. Don’t believe me? Well, here is a graph that illustrates the percentage of pitches by location compiled in a 2 year span in the Major Leagues. This is a representation of over 1.5 million pitches! So, if you are a numbers guy… and friend, baseball is a numbers game… it is only logical to use the numbers in your favor. If most of the pitches thrown for strikes are from the middle third of the plate and away… look for them! Until you have two strikes on you, you can completely dismiss anything on the inner third! Well, not completely… you may be in a premier hitter’s count and have a good feeling on the sequence of the pitches.. and “know” you are getting one on the inner third. Or, you may be so completely confident because you have been stroking balls from the middle third away… and are so locked in with confidence… the pitcher can throw anything at all and you’ll rope it somewhere. That confidence comes from success. And I guarantee you will have success more often (statistically) if you will just concentrate… have a plan… to hit the ball on the outer two thirds of the strike zone to the big part of the field with less than two strikes on you. Oh, gosh… almost forgot… there is one more benefit to this approach; Ever hear the saying “Keep your hands inside the ball”? Yea, guess what… if the ball is in the outer two thirds of the strike zone.. automatic! Your hands are automatically inside the ball. Think about it. The preferred and most successful manner of hitting the ball consistently is what…. keeping your hands inside the ball! The most strikes are on the outer two thirds of the plate. Hmmmm… something says the numbers are in your favor. What is productivity judged by? Yea… numbers. So, bottom line is this; If you go to the plate with “the best hitting tip ever” as your plan… at the end of the season you will be able to look back and say… I like that approach. It works. It makes me a valuable member of my team, somebody the coach and teammates can count on with every single plate appearance. Plus, it’s really very simple to have this approach on every pitch. One pitch at a time. Hit “What you Want” until you have two strikes. What do you “Want”? A strike on the outer two thirds of the plate. Something you naturally are able to hit with your “hands inside” the ball. Hit “What you Can” after two strikes. The strike zone finally gets expanded to include the inner third. Don’t discount that on hitter’s counts.. or at-bats of extreme confidence.. you can “look” for inner 1/3. Especially if outer two thirds approach has already produced a couple of great ab’s in the game. It’s no surprise that Barry Bonds himself was struggling with hitting home runs in his attempt to catch Hank Aaron. Guess how he hit his 755th? Yea, opposite field on a 2-1 count. Hands were naturally inside the ball and bang! History is made!